Simple Secrets of Happiness | Learn Qigong Online @ Discover The Fire! Happiness is really a choice we make. The secret of Happiness is simple, very simple – what is it? However, studies of happiness in several countries have found that these achievements have little to do with your happiness. For millions of people, happiness has remained a rather elusive goal. They’ve tried to buy happiness. They’ve sought it through materialistic and pleasurable activities such as buying a new SUV or going on vacation. But nothing has seemed to work. For most people these changes, new possessions or temporary pleasures, might work for a while but will eventually become part of your status quo, and their power to deliver happiness will fade. Researchers now strongly believe that your brains is hard-wired in ways that, at least to some degree, determine just how happy you’re going to be. Some psychologists believe happiness is genetic. Other scientists say they may have located an important area of the brain where happiness is generated. As powerful as these genetic predispositions may be, happiness is still partly within your control, says David Myers, PhD, the John Dirk Werkman, Professor of Psychology at Hope College in Holland, Mich. “It’s rather like our cholesterol level — genetically influenced, yet also influenced by our habits and attitudes.” While these ideas are debated, you don’t have to wait to begin discovering happiness within yourself. You see happiness comes from your social relationships, enjoyable work, fulfillment, high self-esteem, a sense that your life has meaning, and joining civic and other groups. One way to steer your life toward happiness is simply to count your blessings. Happy people know that they don’t get to be happy all the time. They can appreciate brief moments, little victories, small miracles, and the personal interactions that bring real happiness. Happiness seems to be a selfish goal. 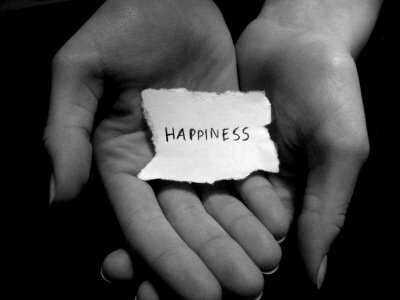 Happiness doesn’t depend upon who you are or what you have; it depends solely upon what you think. So start each day by thinking of all the things you have to be thankful for. Your future depends very largely on the thoughts you think today. So think positive thoughts of hope, confidence, love and success. You can be happy if you are a productive and useful member of society, share with others and help unselfishly. Most experts agree that there are no shortcuts to happiness. Even the happy people do not experience joy twenty-four hours a day. A happy person can have a bad day but still experience pleasure in the small things in life. If you’re not feeling happy today, fake it. In experiments, people who were manipulated to smile actually felt happier. A lot of people share a fairly common misconception. They believe that having lots of money can make you happy. Some even say that the more money you have, the happier you can be. Others believe that having money is not spiritually or socially acceptable, and that money is the root cause of all evil. Are any of these beliefs really true? To answer this question, begin by asking yourself what money means to you, and how do you treat it when you have it? So, it cannot be said that money is essential for happiness. But, most people recognize that money is important in the 21st Century because it can give people comfort and freedoms. But, does raising a nation’s income, as measured by gross domestic product (GDP), raise the population’s overall level of happiness? Intuitively, you’d think the answer is a definite yes. However, a survey conducted by The Wall Street Journal found otherwise. Other studies also show that, in many countries, “although economic output has risen steeply over the past decades, there has been no rise in life satisfaction and there has been a substantial increase in depression and distrust.” For example, since World War II, GDP per capita in the U.S. has tripled, but life satisfaction (measured by surveys that ask something like, “overall, how satisfied are you with your life?”) has barely changed. Also Japan and Western Europe had a tremendous rise in GDP per capita since 1958, yet measures of national happiness have been flat. One reason may be that a rising economy produces rising aspirations. There are many villages in the world where people do not own shoes but the people are extremely happy and friendly. “Don’t worry, be happy.” This sounds like such a simplistic phrase, but there is great power and wisdom in it. This tells us to focus on what we want rather than what we don’t want. When we focus on what we want, our actions take us nearer to our goals in life.One way to guide your life toward happiness is simply to count your blessings. Dr. Myers points to research showing that people who pause each day to reflect on the positive aspects of their lives (for example, their health, friends, family, education, freedom) are more likely to experience positive feelings and happiness. Improve your relationships with friends and family – Happiness starts at home. Start by improving your relationship with your parents, brothers, sisters, and children. Smile when you greet them, do things for them, don’t allow them to get angry with you. Maintaining healthy loving relationships and friendships can promote happiness. Remember that love makes you beautiful. Be an optimist – Optimism generates good feelings. Develop a genuine smile and laugh a lot – Act happy – It works. Smile into the mirror for a half hour without stopping. Smiling makes you happy and the more you smile the more happy you become. We all like people who smile. It also makes us more attractive. Pray – Become religious or spiritual – This only works if you believe in God. If you want to be happy then ask God to make you happy. Prayer helps you accomplish things. Be generous and share with others – Give more than you receive because being generous will make you happy. Treat time as a friend – Don’t watch the clock. Exercise your mind – Keep yourself busy with some new project or ideas. Work your body – Exercise regularly. Studies show that aerobic exercise is an antidote for mild depression and anxiety. “Happy minds reside in sound bodies,” says Dr. Myers. Have fun in life – Keep cool under pressure. Have high confidence in yourself. Give compliments – Take every opportunity to be complimentary. Want to make someone like you? Every time you meet a person smile and give them a compliment. Be honest – With honesty comes openness. People respect honest and open minded people. Keep an open mind – Most people seem to think that they know everything that they need to know. There’s plenty of wisdom to go around. Treat difficulties as challenges –Life’s an adventure and every obstacle in life is one of its challenges. Treat life as a game. What fun would a game be if you could never lose? Being happy is really a choice we make. The secret of Happiness is simple, very simple – what is it? You decide if you want to be happy! Happiness is free. You can feel happiness, this very minute, if you so choose.If you continue to focus all your energy and attention on what you want, you’ll soon find yourself happy. Realize now that true happiness results from sharing generously of yourself, your mind, emotion and spirit, with all those who come in contact with you.Be an optimist. Do kind deeds for others unselfishly. Explore the deeper resources within you by praying to God from your heart. Through sincere prayer and mindful meditation you will attain the highest achievement in life – the discovery of your eternal happiness with God. Pursuing truth, wisdom and a virtuous life – or just getting on with the duties and chores of daily life at work and home, often brings happiness as a by-product. My ultimate goal is to bring happiness to all my friends, family and all souls that come in contact with me. How can I possibly accomplish this?